This article contains facts and information about the life and times of the famous Native American Indian chief known as Kamiakin. Who was Kamiakin and why was this Native Indian chief famous? Summary: Kamiakin (1800 - 1877) was a chief of the Yakama Indian Nation in Western Washington State. Chief Kamiakan called upon tribes to oppose the 1855 Yakama Treaty, which led to the Yakima War (1855-1858). Along with other tribes, they held off U.S. soldiers for about three years. In 1858, at the Battle of Four Lakes near Spokane, the Yakama Indians were decisively defeated. Kamiakan died in 1877. The following fact sheet contains interesting facts, background history and information about the life of Kamiakin and the events in history that led to his fame as a great Native American Indian leader. Meaning of name: "He won't go"
Names of wives: Sunk-hay-ee, the daughter of Chief Teias of the Kittitas Valley tribe and Kem-ee-yowah, daughter of the Klickitat Chief Tenax. Kamiakin was an influential and key leader during one of the encounters that Native Americans had against the white settlers. He was the chief of the Yakama Indian tribe, and was described by is peers as a leader in every sense of the word. He was born in 1800 to a family who had a long line of chieftainship in two Indian tribes. His father was a Palouse Indian named T’siyiyak and his mother was Co-mus-ni of the Yakama tribe, the daughter of the tribe’s chief. Kamiakin was therefore well versed in both cultures, but eventually, his family lived with the Yakama near the Ahtanum Creek, a right-bank tributary to the Yakima River. According to reports, Kamiakin was a well proportioned Indian and early settlers described him as extremely handsome. He wed to two daughters of two separate chiefs and was later married to three more wives. His family ties and connections made him a very powerful and highly influential chief. Kamiakin was responsible for the development of agriculture and irrigation methods to the Yakama tribe together with the introduction of cattle into their livestock. Kamiakin mixed with the white traders in the area from whom he gained many different ideas. He was responsible for the introduction of Christianity to the Yakama Native Indians, and was able to encourage the conversion to nearly 400 of his tribesmen, including his own family. However, in spite his observance of the practice of the customs taught by the Christiian faith, Kamiakin was against the concept of monogamy. He did not want to surrender any of his wives. These were peaceful times for Kamiakin and his tribe but peaceful relations deteriorated in 1853, when the first wagon train of settlers came through the Yakima country along the Naches Pass. Some settlers were not content with merely passing through the lands and tried to establish claims on traditional Yakama grounds. Tensions mounted even further when a group of transcontinental railroad surveyors came into the Yakama Valley. The Americans flattered Kamiakin but he remained wary and such caution was indeed necessary. Isaac Stevens (March 25, 1818 – September 1, 1862) became the governor of the newly created Washington Territory, a position which carried with it the title of Superintendent of Indian Affairs. Isaac Stevens had no sympathy for Native American Indians and Kamiakin received reports from priests and friendly traders of the American's plan to purchase the land, and that refusal was not an option because they would simply seize the region if they Native Indians refused to accept the terms. In 1855 Kamiakin used his influence and family connections to arrange a great council meeting in the region of the Grande Ronde River. His objective was to unify all the tribes in the region and to draw up a map of each tribe's boundaries. The tribal leaders agreed on resisting encroachment by American settlers and government officials in the Washington Territory and insisting that all of their lands be retained as permanent reservations. The Native Indian alliance consisted of a total of 14 tribes living in the region. The Walla Walla Council followed the great council meeting of the tribes and resulted in the reluctant tribal recognition of U.S. sovereignty over a vast amount of land in the Washington Territory. The Native American tribeswere to receive half of the fish in the territory, awards of money and provisions, and reserved lands where white settlement would be prohibited. The terms of the treaty were soon violated when gold was discovered in Yakama territory. The discovery of gold prompted an influx of unruly prospectors who traveled across the newly defined tribal lands. Conflicts erupted resulting in the deaths of both the whites and the Indians. But no action was taken to stop the prospectors. The resistance to white encroachment of their lands, the unification of the tribes and the breaking of the treaty led to the eruption of the Yakima War (1855-1858). The Yakima War (1855-1858) was fought by members of the Native Indian alliance including the Yakama, Walla Walla,Umatilla, Nez Perce and Cayuse tribes. Their leaders were Chief Kamiakin, Chief Leschi and Chief Kanaskat. The Battle of Toppenish Creek in Yakima Valley was the first engagement of the Yakima War on October 5, 1855. American soldiers, under Major Granville O. Haller, were attacked by a band of Yakama warriors led by Chief Kamiakin. The troops were forced to retreat. It was a major victory for Chief Kamiakin and the Native American forces. The Battle at Union Gap was the second engagement of the Yakima War and fought on November 9 and 10, 1855. Seven hundred American soldiers, under Major Gabriel J. Rains, discovered Chief Kamiakin's village of around 300 warriors and the Yakama tribe were forced to retreat with their women and children. Fighting escalated to the other tribes and the U.S. Army drove Native Indian groups further east of the Cascades and across the Snake River. The Battle of Four Lakes on September 1, 1858 effectively ended the Yakima War. The losses were so great that after 3 years of conflict the Native Americans were forced to sue for peace and settle onto reservations. 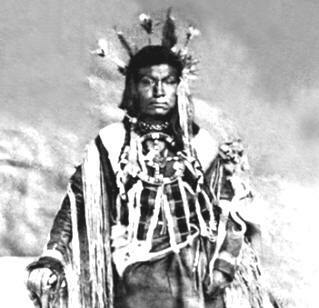 Chief Kamiakin fled to Canada but returned to Walla Walla in 1860 where an amnesty was agreed. He lived with his family at Rock Lake but was eventually forced to move to the newly established Colville Reservation in the north-central part of the U.S. state of Washington. It was here that Chief Kamiakin died in April 1877. He was hailed as “The Last Hero of the Yakimas”. Discover the vast selection of pictures on the subject of the tribes of Famous Native Americans such as Kamiakin. The pictures show the clothing, war paint, weapons and decorations of various Native Indian tribes, such as the Yakama tribe of Kamiakin, that can be used as a really useful educational resource for kids and children of all ages studying famous Native Americans such as Kamiakin. We hope you enjoy watching the video - just click and play - a great educational resource for kids.